The rebuilding of the Seneca-Cayuga Canal by New York State in the 1910s impacted the Trinity Episcopal Church. 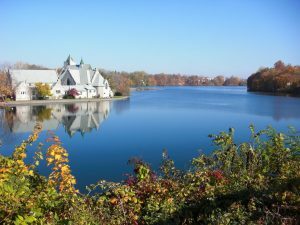 The State’s choice to construct two consecutive locks within the village of Seneca Falls necessitated the creation of an artificial water body—that would later be named Van Cleef Lake. This lake would raise the water level approximately 49 feet. Interestingly, numerous newspapers throughout the state in mid-May 1915 printed an article like what appeared in the Lowville Journal and Republican on May 18, 1915: “Trinity Episcopal church at Seneca Falls is to be razed to make room for barge canal work.” The Seneca Falls Reveille reported that the State of New York had taken possession of the property “by the reason of the construction of the barge canal. This arbitrary action on the part of the State leaves the parish without a church in which to worship, and there seems to be no immediate remedy. It might have been otherwise had wise councils prevailed. Fortunately, these articles were wrong. The congregation fought the state takeover of this property. It took a while, but the beautiful church was spared to the extent possible. The Church basement was filled with dredged rock. The State paid the Church $25,000 (plus $800 interest) to help compensate for the impact. This money was used to build a new heating plant, and Sunday school rooms on the west side of the church. The new parish hall proved to be a timely addition as a base of operations of area churches providing food for many sick families in the great Influenza Epidemic of 1918. County Chapter of the American Red Cross. The present organ was installed in 1924.50 It was made by the M.P. Moller Company. It has two manuals, 35 registers and 9 ranks. In 1954-55, the parish house was renovated. The stage was removed, Sunday school rooms were enclosed, and a second floor was put in. Cayuga Street and was built in 1863. The church is currently making use of a grant funded through the Environmental Protection Agency 1996 Clean Water/Clean Air program. It is a program with a cost of over one million dollars. It has included repairs to the tower and some of the stained-glass windows.